November Challenge Week 2 - my work » What's Under the Needle? 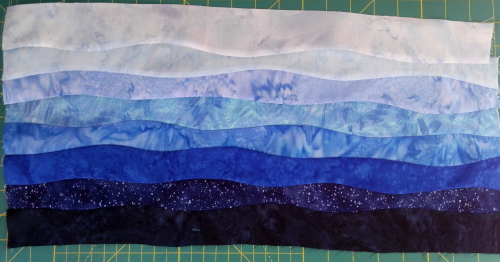 I have to admit, I never like cutting lots of the same pieces over and over to create a block. My style has always been to create variation or irregular shapes. I'm glad it's caught on and now even a technique. It is totally fun, free-form cutting with a rotary cutter and that is what I have planned for my background. 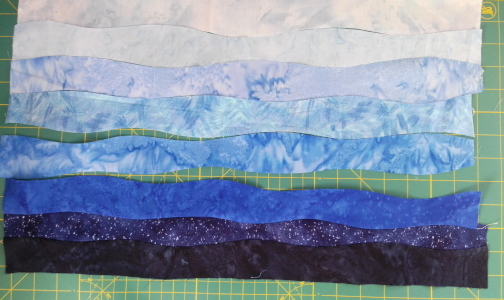 Starting off with half-length (approximately 20" or so) 2 1/2" wide cut strips, I lay them down on the cutting mat overlapping them by 1". 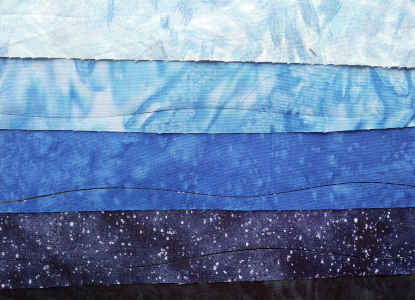 With eight fabrics I should be able to render enough width for my desired size. I can always trim it down a bit if I need to later. 2-1/2" strips overlapped by 1"
Now the fun begins.... using the rotary cutter, I cut curvy lines along the 1" overlap using the cutting board lines as a guide. The trick is not to make them too curvy as sometimes it can be a little difficult to get the seam to lay completely flat after they are sewn. I remove the excess pieces and discard them being careful not to muddle those that remain. 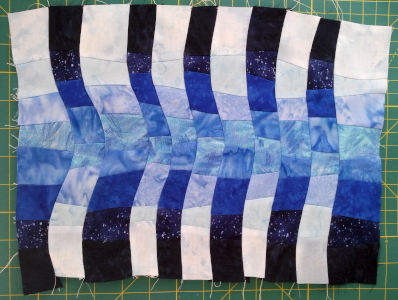 Then I flip the darkest strip over onto the one above it so the right sides are together. 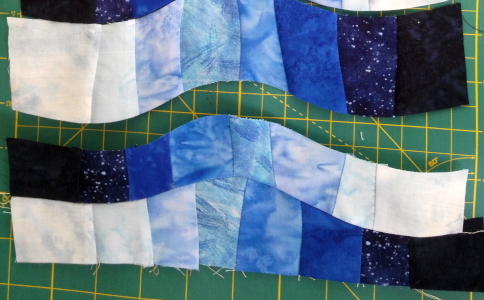 These strips are short enough to pin together at each end and once in the middle. Even though I try to avoid using pins, I found I needed them for this otherwise the fabrics shifted too much while stitching. Now it is just a matter of matching the raw edges together as I stitch. Of course, they also need a good press afterward. I created the video to show you how to do the stitching. 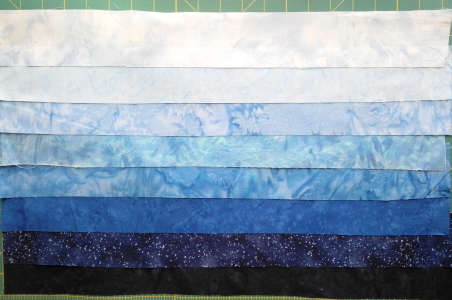 Here's how the background looks with all the strips joined - almost like waves in an ocean. This could work for my background as is, but I'm having too much fun to stop now! I decided to cut this whole block up. 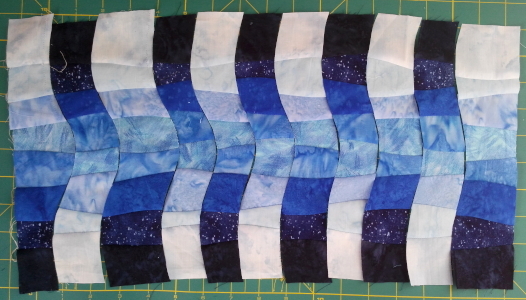 First I cut it in half so I had two pieces, one I flipped upside down so the dark was at the top, then using a similar method, I cut wavy lines across the strips. and voila! ....this is what I ended up with. It almost looks like Emma's river! I'm sure by the time I get my foreground element in place, it will look very different. We'll see next week. Barbara, your comments have to be approved before you get to see them. You can send them to my email or on facebook, either way is fine. I am doing the challenge, but never see my comments and where do I send pictures?